I think this is a bit of a dude food. 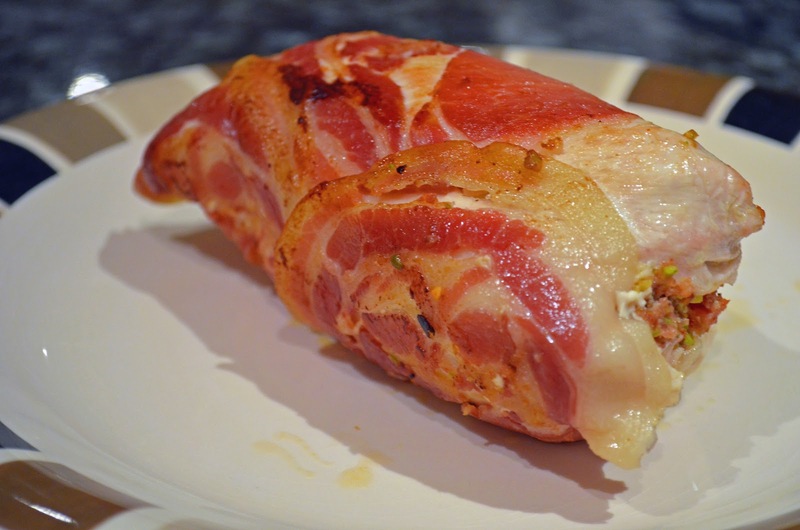 Chicken, chorizo and pancetta. Meat, meat and more meat. Saw this recipe on channel 10 new show called ‘The Living Room‘. 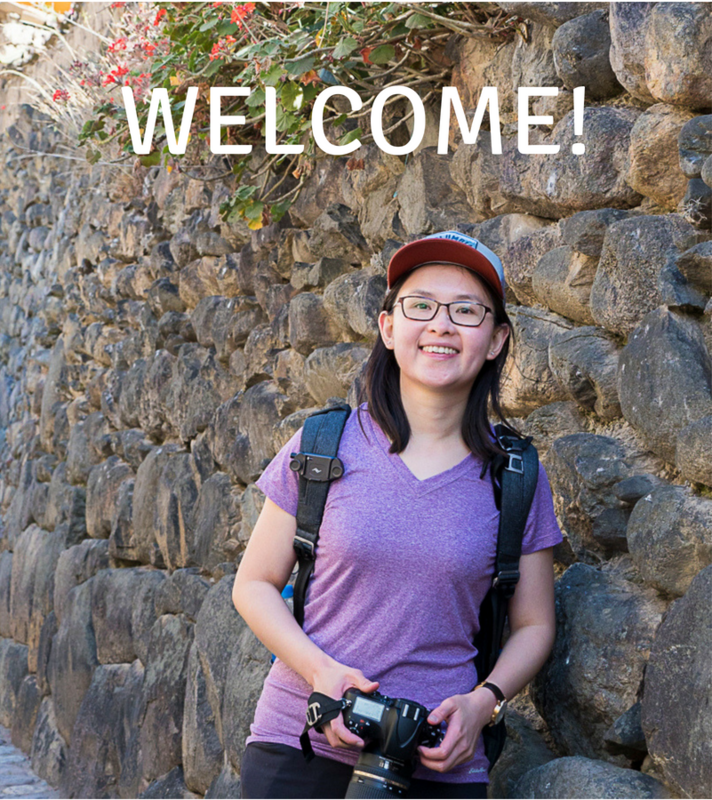 It is an interesting and often funny program that include topics like food, travelling and renovation. This is so easy to make especially if you have a food processor. Just blitz everything together, wrap it up, boil it, pan fry it slightly to make it crispy and then EAT! Chorizo has a very strong flavour so for those who doesn’t like processed meat, I don’t recommend this. It’s very filling too. Bottom: Pancetta, Middle: Chicken breast, Top: Chorizo & pistachio stuffing. All on top of aluminium foil ready to be rolled. 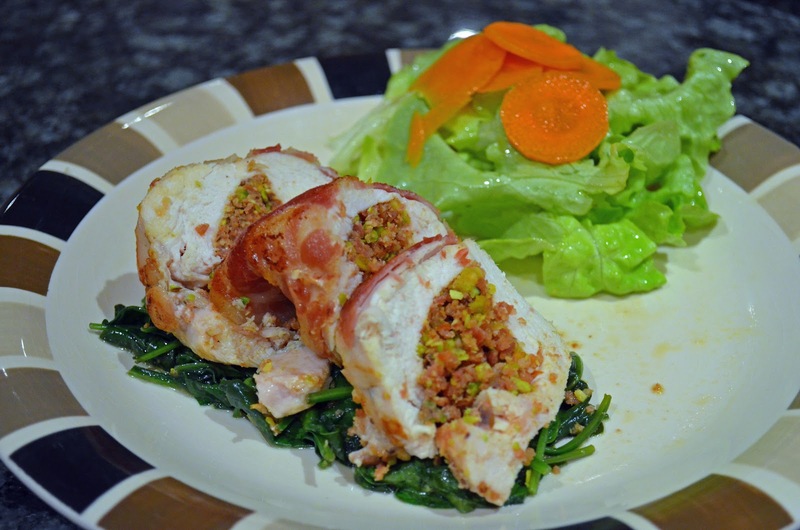 Stuffed chicken with Chorizo & Pistachio, after pan-fried. 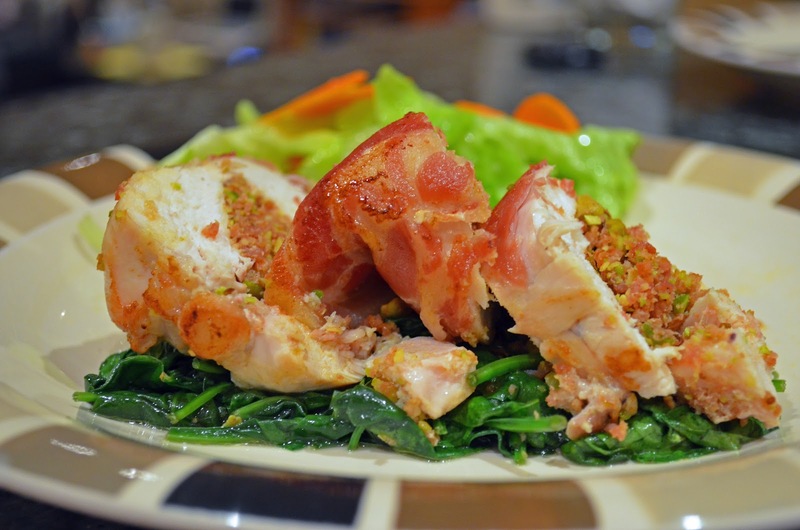 Serve the carved chicken over sauteed spinach and simple salad. 1) In a food processor, blend pistachio and chorizo sausage. This will be the stuffing. 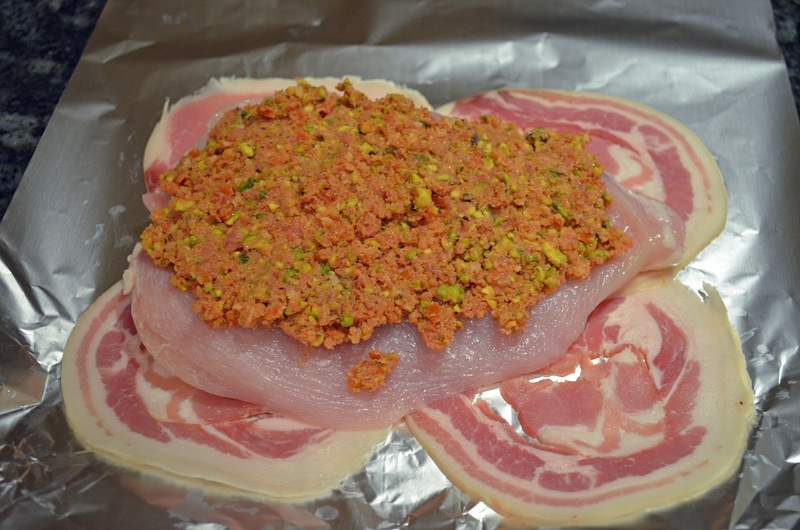 2) On a piece of foil, lay the pancetta around and place the chicken breast in the middle (see photo above). 3) Add stuffing to the centre. Roll very tightly into a cylinder and tie the foil at each end to seal it. 4) Bring a pot, large enough to fit the stuffed chicken, to a boil and poach for about 25 minutes. 5) Remove from water carefully and discard foil. The stuffed chicken should be holding its shape nicely and cooked through beautifully. 6) Pan-fry the chicken until the pancetta is crispy. 7) For the baby spinach, saute in the same pan as for the chicken, for about 3-5 minutes until all wilted. 8) For the salad, mix the lettuce and carrots. Add a few splashes of extra virgin olive oil and a squeeze of lemon. 9) Carve and serve over sauteed spinach and salad at the sides. 1) When adding the stuffing, don’t be too ambitious and add a lot of it. Just add a reasonable amount so that it makes the folding easier. If you add too much, you won’t be able to fold them together. Freeze the remaining stuffing or saute them like what I did. I ate them with steam rice. 2) The olive oil and lemon juice are just extra flavourings for the salad. It is not necessary as I think the chicken has quite a strong flavour to it already. However, if you like another depth to the taste buds, add them. Otherwise, it’s unnecessary. Just the fresh vegetables are good enough. I’ll try this recipe ASAP!!!! You should! Have you tried this recipe yet?